The Hometown Sounds Internet music stream turns 1 year old on Saturday December 15th! To celebrate we’re launching a monthly showcase of great local bands at the brand new music venue 9th & Beats, inside Old Dominion Brewhouse. For the opening weekend of 9th & Beats there’s no cover charge! Come check out DC music in this new all ages space. Adams Morgan rapper Kingpen Slim turned a lot of ears his way with his recent free mixtape Triple Beam Dreams. Yesterday Slim released the latest video from the mixtape, The Haunting. The serious and bleak video, featuring clips from classic films Menace II Society and New Jack City, provides quite a contrast from Slim’s previous fun & raunchy video Lollipop. I am a huge marching band nerd. For seven years I played quads, in high school and college, and I’d probably keep doing it if I could. And I am more than a bit jealous of how much fun Batala has at their shows. The all-women ensemble, playing Afro-Brazilian and Samba-Reggae rhythms, seems to pop up everywhere around town, at parades, festivals and even Fort Reno. They recently made a video for the 48 Hour Film Project‘s DC competition that won “Best/Most Drums”, a category that has my full support. As if doing a band interview podcast wasn’t crazy enough, this week I’ll be doing my first live show simulcast Wednesday evening the 21st at the Velvet Lounge. The solid lineup includes Molly Hagen, Rich Mahogany, and DC/NY funk band Watermelon. 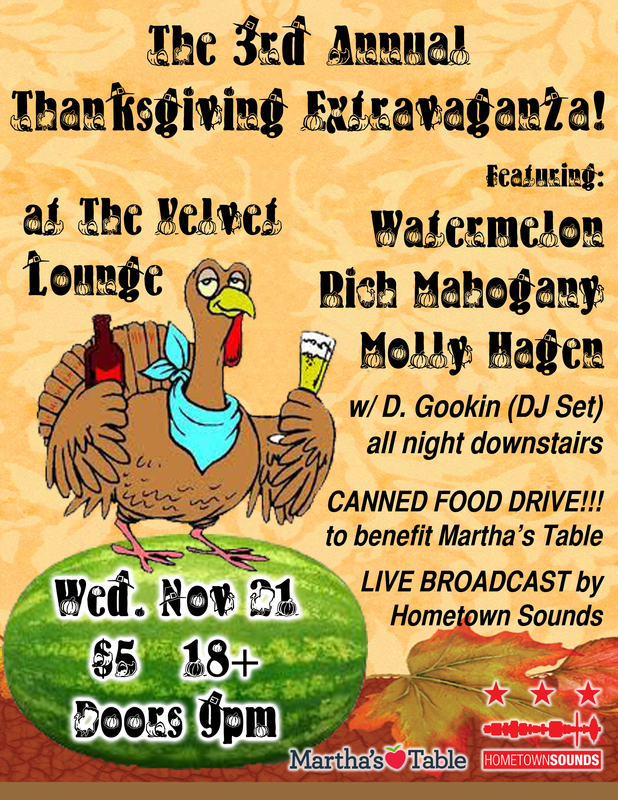 And since it’s the night before Thanksgiving, they’re doing a canned food drive to benefit Martha’s Table. The show’s only $5, so come out if you can! But if you’re traveling or otherwise snug at home that night, tune into the Hometown Sounds stream via iTunes, the free TuneIn app for iPhone and Android, or on our website!